There was an uprising in our yard this week. It was loud and disruptive and needed to be dealt with swiftly and harshly. But not too harshly…we were actually the interlopers, and it turned out to be cute and fuzzy. On Wednesday, I heard an animal in rustling in the high grass. I was a little started, as it sounded large, but eventually it moved away, and the dog stopped barking, and life was good. However, on Thursday, it was a different story. It started moving around about 1 am, and our dog, and all the neighborhood dogs were very perturbed by this. After a couple of hours of intermittent barking we finally saw the Vicious Beast. I had been wondering what types of animals were local to Southwestern Turkey. I really had no idea. I grew up in the woods of New Hampshire, and am fairly relaxed about wild animals. Sometime I’ll tell you the story about when I thought a Bobcat was a housecat because I did not have my glasses on. So I see this dark moving shape outside, and try to figure out what the hell it was. Bülent said it was a Kirpi. Oh, great, a kirpi! I hop on my Turkish/English dictionary…It was a hedgehog. Super Vicious. Obviously worthy of being barked at viciously until 4 am, I mean really. Look at this photo—It will strike fear into your heart. More like strike the warm fuzzies into your heart. For all that was good in the world, we wanted to find the beast and strike it from the face of the earth, or at least relocate it from the yard so the dogs would stop torturing us at night. So on Friday, we started searching for the hedgehog, it was pretty easy. When our dog started frothing at the mouth, we knew it was out of its den and out in the yard. 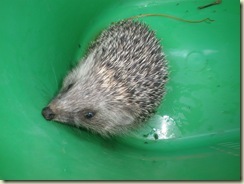 The thing about hedgehogs—they aren’t fast and when confronted they roll in a ball and wait it out. So the “capture” involved using a broom to brush what looked like a large dust bunny into a bucket. We drove several miles away and let it go, far away from the road, in the woods. 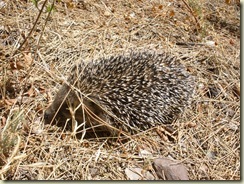 This entry was posted in Hedgehog, Marmaris and tagged Expat, Turkey, Wildlife by Jules. Bookmark the permalink. Hey Jules! Great to have you as a follower of Maya's Adventures! How did you hear about it by the way?